Copyright (c) – Plus 8 Records Ltd.
[c] 2000 Plus 8 Records Ltd.
All parts made in Canada. Matrix / Runout (Side AA): PLUS8072-AA IN THE YEAR 10 OF THE FIRST(RE)INCARNATION, THE 2 BABES CAME UPON A CROSSROAD, ONE CHOOSE THE PATH OF THE ENLIGHTMENT, THE OTHER...? IMO Speedy J was always one of the most over rated dudes in global techno, making cheesy tunes. however, Public Energy 12" is a killer and this one here is a classic. that whole "spastik"/"washmachine"/"tribal bells" etc etc etc vibe, you can rock this for a good 30-45 into a set, and when u finally drop a song that at least has a bassline on top of the drums, the crowd will lose it. both "Glitch" tracks are nice too, hard techno that plays around with the filter and fidelity issues for the duration of both tracks. Speedy J once again teaming up with the legendary Plus 8 Records, and though he changed his style at least twice since this was the hit, it remains one of the label's last great releases. In fact, I consider it the only truly indispensable post Y2K 12" released by Plus 8, along with the absolutely marvellous "El encuentro" EP by Alex Under from 2006. The title track is a fabulous builder with a ferociously loud turn for the better just when you thought you wouldn't get a climax. Massive. Percussive. Speedy J's finest club demolisher together with the "Krekc 12" EP". Glitch & Glitch 2? Equally effective. They both progressively build up to highly energetic explosions of banging percussion and sharp noises. Great, really great hard techno from back in the day before the klik-klaks took over. 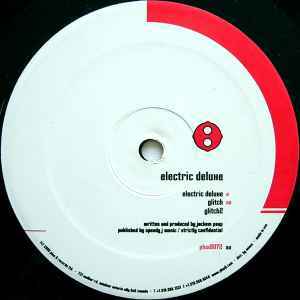 Electric Deluxe - Just when it sounds like the tune is going to end, it changes, building into a frenzy, many many listens later and I said I had to make a comment, absolutely brilliant stuff from "Speedy J"